David Zeiler writes: More experts are saying what most Americans have suspected for years - the real inflation rate is much higher than the government is willing to admit. "Government data are biased in politically correct directions and increasingly have diverged from common experience and reality since the mid-1980s," Williams says on his Web site, Shadowstats.com. Changes to the CPI began under the tenure of Fed Chairman Alan Greenspan, who set the stage in the early 1990s by publicly complaining about how the CPI overstated inflation. 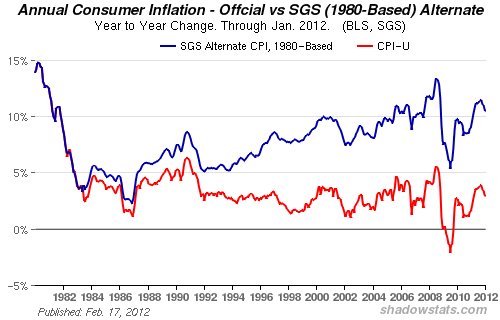 By 1999, the CPI had incorporated the idea of "substitution." Instead of simply measuring how quickly prices were rising, the CPI added consumers' reaction to those price changes to the formula. Successful bargain hunting means inflation isn't hitting you as hard, the government said, ignoring the impact such adjustments have on a person's standard of living. "The old system told you how much you had to increase your income in order to keep buying steak," Williams said. "The new system promised you hamburger, and then dog food, perhaps, after that." Another adjustment, "hedonics," adds value to goods based on how much better they are than previous versions. "Now we don't take the real prices of computer chips, for example, but their price deflated by capacity, so every Moore's Law doubling of chip capacity halves the price," explained Money Morning Global Investing Strategist Martin Hutchinson. "Of course, doubling chip capacity doesn't double the functionality, so the whole "hedonic' theory is rubbish." Or, as Williams puts it: "When gasoline rises 10 cents per gallon because of a federally mandated gasoline additive, the increased gasoline cost does not contribute to inflation. Instead, the 10 cents is eliminated from the CPI because of the offsetting hedonic thrills the consumer gets from breathing cleaner air." The government has strong motives for masking the real inflation rate. •Political Gain: This should surprise no one given the self-serving attitude that permeates Washington. Elected leaders know positive economic news, such as inflation that's under control, sound good in campaign speeches and can make the difference in a close election. In non-election years, fudging numbers like the CPI serves to avoid public pressure to do something to fix it. Government statistics that show inflation is not a problem keeps the issue off the public radar, regardless of the reality. •Big Savings: Many government entitlements, most notably Social Security payments, are linked to the CPI. Lower official numbers mean lower payouts. The ploy has saved the debt-ridden U.S. government billions of dollars, but has taken money from the pockets of American citizens. Williams says Social Security payments would be twice as high each month if the CPI formula had never been changed. It's no wonder so many seniors struggle to make ends meet. And it could get worse. Last fall's debt super committee suggested basing Social Security increases on a variant of the CPI that would lower payments even more. •Keeping Interest Rates Low: Although not responsible for the CPI, the Fed prefers it stay as low as possible to obscure its own inflationary policies. Fed policies like quantitative easing and holding interest rates near zero should have pushed inflation much higher - but the CPI's mutant methodology made sure that didn't happen. If the CPI were reported accurately, the Fed would be forced to raise interest rates, which in turn would slow the economy and slam the stock markets. That's not a headache the Fed or the elected leaders in Washington want. And then there's the bonus of allowing inflation to devalue the dollar to help reduce the nation's $15 trillion debt burden. Although the BLS Web site devotes an entire page to defending its methodology for calculating the inflation rate, Americans see the reality every time they go shopping or pay a bill. But with the altered CPI serving Washington so well, even pointed criticism from such prominent figures as Rep. Paul is likely to fall on deaf ears. "Every single day [the dollar] buys less the next day," Paul complained to Bernanke. "To me it's sort of like...a builder had a yardstick that changed its value every single day. I mean, just think of the kind of building we would have."